Helping you find your feet in Bible journalling, this guide gives you tips and ideas for reading the Bible and finding creative inspiration within its pages. A wide range of creative exercises deliver the encouragement needed to explore faith through the creative process. Whether working with coloured pencils, markers, watercolour, or stamps, when it comes to faith journaling, there are no rules! In Faith Journaling for the Inspired Artist, you'll not only learn how to expand your artistic horizons, but also discover how to give yourself permission to create personal artistic expressions of your faith. 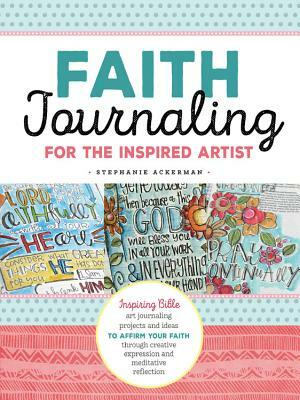 Faith Journaling for the Inspired Artist by Stephanie Ackerman was published by Walter Foster Jr. in September 2017 and is our 11918th best seller. The ISBN for Faith Journaling for the Inspired Artist is 9781633223653. Really helpful,will be using it as a resource in a teaching session at a prayer retreat. Got a question? No problem! Just click here to ask us about Faith Journaling for the Inspired Artist.